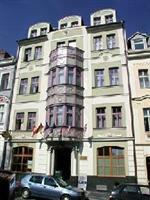 The Derby Hotel Karlovy Vary is located within close proximity to much of what the city has to offer. This provider of Karlovy Vary accommodation is near many of the city's historical attractions and close to the hot springs that constitute the most significant reason that the city continues to be such a popular tourist destination. The Derby Hotel Karlovy Vary is located approximately 2 hours from Prague. Karlovy Vary has its own airport, as well. The rooms at the Derby Hotel Karlovy Vary include amenities such as televisions, Internet access, work desks and private baths equipped with hairdryers. There are two rooms at this facility which are handicapped accessible. The Derby Hotel Karlovy Vary can provide its guests with access to a variety of services. There is a spa onsite which offers a variety of treatments as well as a whirlpool and sauna at the disposal of guests. The hotel can help guests arrange for practical needs such as renting cars and the storage of valuables in the hotel's safe deposit box.